What a month May has been! We’ve had a phenomenal month and thoroughly enjoyed working. Our team have completed a number of projects and have pricked this hardwood conservatory installation as the chosen case study. This conservatory has been an amazing project to work on and we had a great time completing it. 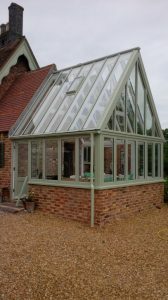 We’d like to share with you this conservatory installation so that you can learn more about Archway Joinery and the services we provide to our clients, all of which to the highest possible standard. What did you think of this project? We’d love to hear some feedback from you in regards to this conservatory installation. Whether you’re looking for something similar to this for your own property, or looking for inspiration on how you can improve your overall property, Archway Joinery are here to help. We will be happy to advise any suggestions to help move your property to the next level with our bespoke joinery services. Or for more information on the services we provide, please don’t hesitate to get in touch today. Our team will be happy to help bring your ideas to life and improve your home in a way that suits you. We look forward to hearing back from you.